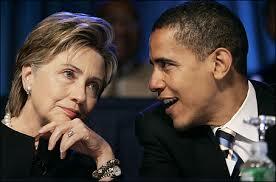 White House dismisses speculation about Obama-Clinton ticket…or Gibbs to the DNC…. Gibbs said President Obama thinks Vice President Biden is “doing an extraordinary job,” and Obama is “quite pleased” with the work Clinton has done at the State Department. Clinton dismissed any aspirations of being vice president at the Fortune Most Powerful Women Summitt in Washington. There had been previous speculation that Vice President Biden could vacate his post in 2012, but the White House has dismissed that possibility too. An Obama-Clinton ticket would unite the two former rivals, who ran a down-to-the-wire race in the 2008 Democratic presidential primary. 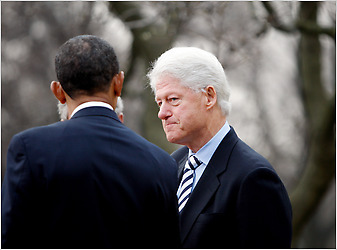 A recent Gallup poll also sparked talk that Clinton could re-enter presidential politics in the next reelection cycle. Fifty-two percent of Democrats said they would vote for Obama in a hypothetical Democratic primary rematch against Clinton, opposed to 37 percent who say they would vote for Clinton. Hillary Clinton Political funds update…..
Here’s an update on the Secretary of State ….. and former Senator’s….. political committee’s ….. Though not against the law per-say….. Secretaries of State do not usually perform political functions…..(Condi Rice did do some, which was frowned upon )……. Nearly two years after Secretary of State Hillary Clinton ended her losing presidential campaign and endorsed rival Barack Obama, Clinton’s allies maintain a triad of groups that have continued to make her presence felt in the political world — and could serve as a platform for the next phase of her public life. Her presidential campaign committee, still in the process of winding down, maintains and makes money off a lasting asset from her presidential bid — an e-mail list of 2.5 million core supporters. Her Senate campaign committee accrues modest interest on a $1.9 million nest egg. And a thriving foundation called No Limits, founded after Clinton resigned from the Senate to join Obama’s Cabinet, works to burnish her legacy, maintains contact with Clinton supporters and pursues a policy agenda that closely mirrors Clinton’s own — health care and women’s issues. The three entities operate almost completely apart from Clinton, who is barred by protocol from active involvement in outside groups (particularly those involved in partisan politics). But their operations are intertwined, sharing the same Washington offices and drawing from the same pool of supporters and staff. The presidential campaign committee, for example, splits the salaries of four employees with Clinton’s Senate campaign committee, and both committees continue paying legal and rent bills and various other operating costs. No Limits has paid the campaign committee $400,000 to use its e-mail list, according to Federal Election Commission filings. She could always come back and replace Kirsten Gillibrand for her old Senate seat….I’d love that! Women’s History month and Hillary Clinton and Nancy Pelosi……..
House Speaker Nancy Pelosi and Secretary of State Hillary Rodham Clinton surely will rank for placement there someday. For now, they are making history, and on Thursday, at a reception in that hall, the two took an hour to celebrate together. 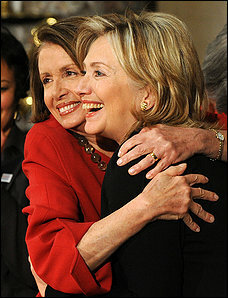 Pelosi opened her arms wide to Clinton and they hugged tightly, cheek to cheek, two brilliant red-lipsticked smiles. It was an exuberant display of girliness from two formidable women nearing the end of an extraordinary week for both. “Whoever thought that on this day of all days, I’d be standing on this podium to celebrate Women’s History Month and sharing the stage with two of my role models and two of the greatest female pioneers and role models for all of us?” said Rep. Lynn Woolsey (D-Calif.), to cheers, applause and whistles from a crowd of 300 women and men. Pelosi and Clinton are a testament to women’s capacity to compose their lives alongside, rather than distinct from, those around them. One is the first female speaker of the House, a woman who didn’t run for office until the youngest of her five children was a high school senior. The other is the first former first lady to become a U.S. senator, a woman who initially derived her political power from her husband and then went on to run for president, winning more than 17 million votes in primaries and caucuses. One traveled to Mexico and Moscow in the past week and helped to negotiate a deal announced Wednesday that could slash the number of nuclear weapons in the United States and Russia. The other finally brought her disputatious membership to heel and succeeded, where the first had so famously failed, at achieving the sweeping health-insurance reform Democrats had sought for half a century. We as a nation we WILL get there….We have a black mixed President….I know we’ll get there…..
Women's History month and Hillary Clinton and Nancy Pelosi……..
And people thought?…..Oh, my gosh!….Will they ever trust each other? How could she work for him? Turns out everything is fine……. The Dog has always a soft spot in his heart for the tough, hard working, and slightly wounded Hillary Clinton…. “We’ve developed, I think, a very good rapport,” said Hillary Rodham Clinton, the secretary of state, assessing her relationship with President Obama. On a snowy Thursday shortly before her weekly meeting with President Obama last month, Hillary Rodham Clinton got a distressing phone call: her husband, Bill Clinton, was in a hospital with chest pains and needed an urgent heart procedure. Mrs. Clinton kept her appointment with Mr. Obama in the Oval Office, taking her customary seat on the yellow sofa as the two talked about her coming trip to the Persian Gulf, where she planned to turn up the heat on Iran over its nuclear program. “No one had any idea” that she might have had a personal worry, said a senior White House official who was present. Afterward, Mrs. Clinton raced for a shuttle flight to New York to see her husband. But the fact that she first spent 45 minutes plotting Iran strategy with the man who beat her in a divisive primary campaign shows just how far Mr. Obama and Mrs. Clinton have come since the bitter spring of 2008, when he sniped that her foreign-policy credentials consisted of sipping tea with world leaders, and she scoffed that his consisted of living in Indonesia when he was 10. Sixteen months after Mr. Obama surprised nearly everyone by picking her as secretary of state, the two have again surprised nearly everyone by forging a credible partnership. Mrs. Clinton has proved to be an eager team player, a tireless defender of the administration, ever deferential to Mr. Obama and careful to ensure that her husband, the former president, does not upstage her boss. 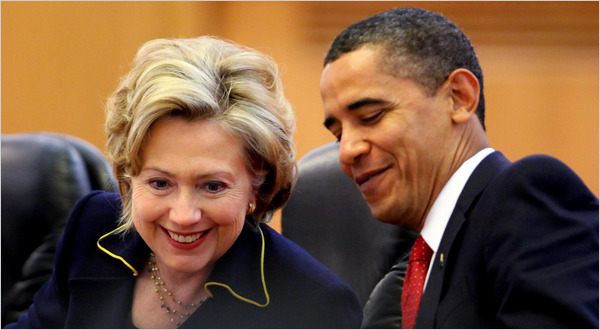 Mr. Obama has been solicitous of Mrs. Clinton, yielding to her at times in internal debates, even showing signs of adopting some of her more hawkish world views. They now joke about their “frenemies” status and have made gestures toward each other’s families. When Mr. Obama learned that Chelsea Clinton had become engaged, he turned to Mrs. Clinton and asked, “Does she want a White House wedding?” a senior official recalled. (Mrs. Clinton declined, saying the offer was “sweet” but would be “inappropriate.”) And when Mrs. Clinton traveled to Honolulu in January, she paid tribute to Mr. Obama’s mother, Stanley Ann Dunham, in a speech she gave while looking over a garden dedicated to Ms. Dunham. Still, there is none of the deep familiarity or the tight bonds — the round-the-clock, back-channel access — of their predecessors, Condoleezza Rice and George W. Bush, or going further back, James A. Baker and the first President Bush orHenry A. Kissinger and Richard M. Nixon. Mr. Obama has jealously guarded his prerogatives as the architect of American foreign policy, concentrating decision-making on crucial issues like Iran, Iraq and the Middle East in the White House. And Mrs. Clinton has yet to stake a claim to a core foreign-policy issue, the kind of signature role that would allow her nascent partnership with Mr. Obama to become a truly historic alliance. …….and by the way…Why did he mention the ‘Public Option ‘ a few days ago?…..Congress just ain’t doing it…didin’t he get the message? PLEASE check the video link……. The Dog may like the guy...but Hillary nailed it! This from the Mydd.com piece……..
Thirteen months into the Obama Presidency, Clinton’s assessment is as valid as ever and of increasing concern. The President has spent a year courting the Republicans with precious little to show for his efforts. The Republicans, meanwhile, have largely achieved their aims of grinding government to a halt and seem poised to make substantial electoral gains come November’s mid-term elections. Obstructionism may make for ugly governance but it sure seems likely to pay handsome political dividends. What compromise has been achieved in the halls of government has largely come at our expense, not theirs. The public option is off the table, while tort reform seems forever on it. It is not just healthcare reform, if it can be called that at this point, that is stalled; it is just about every major part of the Democratic agenda. The Wall Street Reform and Consumer Protection Act, the American Clean Energy and Security Act and the US Postal Service Financial Relief Act – all passed by the House – languish in the Senate. In total, 290 bills sit gridlocked in the Senate’s docket stalled by the partisan tactics of Mitch McConnell and Company. It is increasingly evident that the President’s style as the conciliator-in-chief is not working. The strategy is unlikely to peel away a single Republican vote even as it jettisons wholesale the progressive agenda. More tragically, the probability of the President modifying his consensual approach to governing is nil. He is who he is. In his soul, he remains the community organizer who just wants to bridge differences and forge compromises. But the back halls of Washington are a far cry from the streets of south side Chicago. It is not that I bemoan the President’s good-heartedness, his level-headedness or his even-handedness but there comes a point when one has to ask where are the results of this reaching out to the other side? It is as if the cause of Obama’s Presidency is bipartisanship simply for the sake of bipartisanship. The policy be damned, but get me Olympia Snowe’s vote seems to be his mantra. While the President did campaign on the necessity of changing the tone in Washington, the GOP remains tone-deaf. What is there to say when Minority Leader John Boehner rails that the President “basically crippled the summit expected on Thursday by coming in with a rerun of the same failed bill that couldn’t pass the House or Senate.” For a President who is hailed as a being attentive, he tunes out the vitriol that emanates from the GOP to his own detriment. He simply refuses to take the GOP at their word. Furthermore the White House seems blind to the reality that their approach is alienating the fickle to start Democratic base. It is as if our support isn’t wanted. It’s a rare progressive who is going to get excited over mandated insurance that ensures the bloated profitability of the insurance industry. Let me be brief and blunt: the President’s belief is predicated on the assumption that he is dealing with rational actors. His premise is that the GOP can be reasoned with yet the evidence for such a belief is scant. This is not the party of Abraham Lincoln or Theodore Roosevelt or even Gerald Ford or Jacob Javits. This is the party of Sarah Palin, Michelle Bachmann, James DeMint and James Inhofe. For every Lindsey Graham, there are ten Joe Wilsons. For every Olympia Snowe, there are ten Virginia Foxxes. The Dog said this during the campaign, and has said it for the last month….’the guy has gotta get a back bone’…….really…..
From Talkandpolitcs……..Justice Obama and President Hillary …. Finally – this scenario made good sense. Obama is a perfect fit for the Supreme Court, with his cool temper and background. New seats are soon up for grabs, and he could easily be the greatest liberal justice of the 21st century. It makes perfect sense. And Prez Hillary makes the nomination. Updated from the New York Times.…..Former President Bill Clinton was taken to a New York hospital today after experiencing chest pains, and underwent heart surgery, his office said. Doctors inserted two stents into his native coronary artery after one of the bypass grafts from an operation five years ago became obstructed. Last month, former President Clinton appeared at the White House with President Obama and former President George W. Bush to discuss aid relief for the survivors of the Haiti earthquake. “President Clinton is in good spirits and will continue to focus on the work of his foundation and Haiti’s relief and long-term recovery efforts,” his counselor, Douglas J. Band, said in a statement released by the former president’s office. Mr. Clinton, who serves as the United Nations special envoy to Haiti, has been spending much of his time in recent weeks trying to coordinate relief and recovery efforts for the Caribbean island after a devastating earthquake claimed more than 200,000 lives. Mr. Clinton just returned a few days ago from his second trip there since the earthquake. Mr. Clinton, 63, has a history of heart trouble. He had quadruple coronary artery bypass surgery in 2004 and later developed rare complications affecting his lungs that required another operation six months later. He was taken Thursday to the Columbia campus of New York Presbyterian Hospital, the same facility where he was treated six years ago. Secretary of State Hillary Rodham Clinton learned of her husband’s condition after she concluded a meeting with President Obama in the Oval Office. An associate of Mrs. Clinton’s said she was in Washington, but making plans to head to New York City late this afternoon. Mr. Clinton’s health has been a concern ever since the 2004 heart operation. By his own account, he had never been entirely the same. “It changed me,” he told The New York Times last year. “One of the things I noticed is that on normal days ever since I had that heart surgery, I’m a lot more laid back and a lot more relaxed and a lot more healthy. Women in Politics….attacking the ‘highest and hardest’ glass ceiling…. Hillary Clinton, Sarah Palin, Jennifer Granholm, Amy Klobucher and others find that being on the national stage as a women isn’t so easy….It involves to knowing your voters and going back and forth between being powerful…but no threating…..Being good looking…but not too good looking…..And sometimes putting your emotions in check…..
Here’s the story by Anne E. Kornblut who covered Hillary Clinton and Sarah Palin extensively during the last presidential primaries and general campaign…..